Since landing his first music publishing job in 2006, Josh Van Valkenburg has gradually become one of the top creative execs in the Nashville music business. This past July (2015), Van Valkenburg was promoted to Senior Vice President, Nashville A&R for Sony/ATV Music, which is one of the top music publishing companies in Nashville. 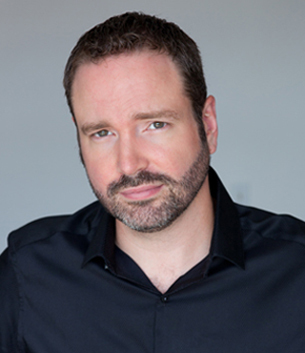 In this position, Van Valkenburg is Head of A&R—he is responsible for artist and songwriter signings, developing Sony/ATV’s existing roster, and managing the A&R creative team. Van Valkenburg reached this position because he has demonstrated the ability to sign, or help develop, many of the hottest songwriters on the country charts. He has been instrumental in the careers of hit songwriters Ross Copperman, Jon Nite, Chris DeStefano, Natalie Hemby, Heather Morgan and others. These songwriters have co-written number one hits for Luke Bryan, Keith Urban, Carrie Underwood, Jason Aldean, Brett Eldredge, Miranda Lambert, Blake Shelton, Dierks Bentley and other artists. In addition, Van Valkenburg has signed or worked closely with hit artists Brett Eldredge and Chase Rice. Van Valkenburg grew up in Franklin, TN, and began his music publishing career in 2006, working at EMI Music in the tape room. It was in 2008 that he was promoted to the A&R team as Creative Manager. From that point on, Van Valkenburg has been able to discover talented songwriters, helping them get cuts and setting up important co-writing sessions. In 2012, EMI Publishing was acquired by Sony/ATV Music, so Van Valkenburg joined the Sony/ATV creative team as Creative Director. With many of his songwriters having had major success this year, Van Valkenburg was appointed Senior Vice President of A&R by Troy Tomlinson, President/CEO of Sony/ATV Nashville. He now manages the highly successful A&R team which includes Terry Wakefield (Senior Vice President of Creative), Tom Luteran (Vice President of Creative), Abbey Adams (Senior Director of Creative), Hannah Williams (Creative Manager) and Ed Williams (Creative Manager). We are pleased to do this new Q&A interview with Josh Van Valkenburg. He tells how he got started in the music business, and discusses the hit songwriters and artists he works with. He also offers tips to new songwriters who are trying to break into the Nashville music industry. DK: How did you get started in the music business? Are you also a musician? Van Valkenburg: I’ve played music my whole life. I play drums, mainly, but I grew up playing bluegrass so I can fake my way around most stringed instruments. My parents actually got together while in a bluegrass band. We moved to Nashville because my mom wanted to be a country songwriter. My parents didn’t really know many people when we moved up here, so a lot of their friends came from the people they’d meet at local pickin’ parties. My weekends were often spent in some bluegrass jam session playing mandolin. I also played rock & roll, blues and jazz. Once I got serious, playing drums came naturally to me. I played in a bunch of bands while attending college at MTSU (Middle Tennessee State University). I went to MTSU because I wanted to be a musician, but I also wanted to learn about the music business. DK: What did you do after graduating from college? Van Valkenburg: I took a job drumming for a couple different artists on the road. It would be six nights a week, four hours a night playing live. I traveled all over the U.S. It was fun, but I realized it wasn’t going to be for me. I didn’t want to be a gun for hire. Pictured (l-r): Brett Eldredge, Ross Copperman, Josh Van Valkenburg & Heather Morgan. DK: Was it then that you thought about working in music publishing? Van Valkenburg: Yes. I was always bothered by the fact that as talented as my mom was as a songwriter, she never really had anyone who was willing to fight for her. She needed someone who was willing to deal with the “business” side, so she could focus on the most important part of being a songwriter—writing a great song. I thought about how I would be inspired to find a great songwriter and be their champion. I wanted to get in the trenches for them so they didn’t get beat up. I called a buddy, Chris Van Belkom. He had recently landed a gig at Combustion Music. I asked him to let me know if he heard of any job opportunities. Chris helped me land an interview with Glenn Middleworth, who worked at Famous Music. Glenn ended up not hiring me, but he sent my resume to Ben Vaughn, who was then Head of A&R at EMI Publishing. I met with Ben and Gary Overton (Executive VP/GM at EMI), and they decided to hire me for the tape room (in 2006). I jumped in there and hustled and kept my head down—the goal was to become a songplugger. Then in 2008, Ben offered me the gig as Creative Manager, joining their A&R team. DK: Which EMI songwriters did you start having success with? Van Valkenburg: The first success I had was with Ross Copperman. At the time, Ross was signed as a rock artist to EMI Publishing in the U.K., but he had moved to Nashville and wanted to write songs for country artists. Making the transition is usually hard to do—99 out of 100 writers have a tough time shifting genres completely. If you’re a great writer in L.A. or New York, it doesn’t mean you’ll be a great writer in Nashville. When I sat down with Ross, I wasn’t expecting much since I had been through these types of meetings before where a writer from another genre was trying to work their way into country. I was shocked when he started playing for me. The songs he played me were far from country music, but he was unbelievably talented. I knew he could be that rare person who could make the transition to writing country. So I started working with him to help him fine tune his writing style to fit this market and get some demos together. Ross was amazing…that dude works as hard as anyone else. After a couple years of working for little money and less success, he got his first single, “Glass,” which was a hit for (the duo) Thompson Square. Over the years Ross and I have become really close. We talk every single day. It’s been fun to watch our relationship grow along with our careers, as my role in his professional life now consists more about helping him make the best creative and political decisions for his writing and production schedule, rather than critiquing the quality of his songwriting. It’s amazing to think we’ve been working together for seven years. (Note: Copperman has become one of Nashville’s hottest songwriters; he recently co-wrote #1 hits for Luke Bryan, Brett Eldredge, Billy Currington, Thousand Horses and Keith Urban). 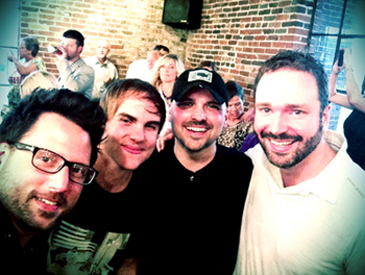 Pictured (l-r): Sony/ATV hit songwriters Chris DeStefano, Ross Copperman & Jon Nite with Josh Van Valkenburg. DK: Who are some of the other writers that you’ve had success with? Van Valkenburg: The next would be Jon Nite. Jon had been signed at the music publishing company my wife worked at, and had written that song “Glass” with Ross. He was released from his deal, and I quickly jumped in and signed him (in 2009). I believed he would be a hit songwriter. Jon is the definition of a Nashville songwriter in its purest form. The lyric always comes first when he’s in the room. Until the words are right, he’s not satisfied. I listen to a ton of music every day, and he still has the ability to stop me in my tracks with one of his songs. For all of the success Jon has earned, his high standards for his music has never wavered. I’m so inspired by that. (Nite has also co-written hits for Luke Bryan, Dierks Bentley, Keith Urban, Tim McGraw, Chase Rice, David Nail and Jake Owen). Since 2010, I’ve also been working with Chris DeStefano. Chris had been signed years before out of our New York office. He then moved to L.A. and was trying to make things happen. Around that time, I put a writers’ camp together (in Nashville) for Matthew Morrison of (the TV show) Glee. Our L.A, office asked if Chris could come to the writers’ camp. Chris showed up for the camp and got right to work. I remember listening to one of the songs he had written on the first day and being floored. Chris was just working in a room with a Pro Tools rig and an acoustic guitar, but he created a demo with a huge, bombastic sound. I couldn’t figure out how he had produced something so impressive, working with so little. I immediately felt compelled to help him have success in Nashville. At first, he bounced back and forth between LA and Nashville, but he finally moved here in 2011. He connected with (hit songwriter) Ashley Gorley and co-wrote “Why You Wanna,” which became a hit for Jana Kramer. He and Ashley then co-wrote “Good Girl” with Carrie Underwood, which became a hit for her. From there it’s been a steady stream of #1 songs for Chris, both as a writer and producer. It’s been a pleasure to watch his passions for producing and writing become reasons for celebration over and over again. (DeStefano has since co-written several more #1 hits for Luke Bryan, Billy Currington, Brett Eldredge, Jason Aldean, Dan + Shay and Miranda Lambert). Another [hit writer] I worked with was Natalie Hemby. She had co-written the hit “White Liar” for Miranda Lambert and was looking for a new publishing deal. We jumped at the chance to sign her, and she and I became dear friends. Natalie is one of the most unique writers in Nashville because she thrives far outside the box that is commercial country music, yet she has an innate sense of what makes a hit song. When we started working together we came to a quick understanding: if she was willing to dabble a little bit more on the commercial side, I would make the effort to find opportunities in other areas of music that would inspire her and keep music fun. We worked closely together for three years and she had four #1 hits during that time. DK: In 2012, when you were working with these writers, EMI merged with Sony/ATV. How was the transition to Sony/ATV? Van Valkenburg: The transition to Sony/ATV was smooth for two main reasons. First, the Nashville community is special, in that the fiercest competitors can also be close friends. EMI and Sony had been vying for the top publishing spot in Nashville for years. Both A&R teams were always crossing paths, whether it be through connecting each other’s writers for co-writes, seeing each other at the same cattle-call pitch meetings, or celebrating together when our writers shared a piece of a hit. To shut one another out, or treat each other with disdain would have been a disservice to our writers. Therefore, when it was time for the EMI creative team to join up with the Sony team, we were already familiar. Thankfully, the Sony team was incredibly gracious and welcoming when we first came over. The second reason would be the leadership of Troy Tomlinson (President of Sony/ATV Nashville). Troy made sure both teams felt appreciated and respected for their success up to that point. He was also consistent with the message that we were no longer two teams, but one top-notch unit. Troy was kind enough to take me under his wing, and he’s been a strong mentor for me—not only in music publishing, but in life. We have a great relationship. We understand each other and we agree on what a good publisher should focus on, which is to put the songwriter and music first. I’ve learned a lot from Troy. 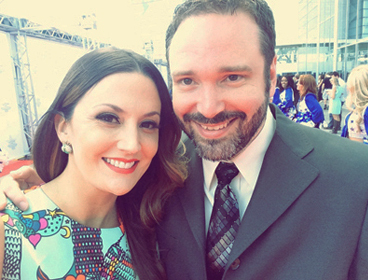 Josh Van Valkenburg with hit songwriter Natalie Hemby at the ACM Awards. DK: In addition to the hit songwriters you’ve mentioned, you work with some excellent artists at Sony/ATV: Brett Eldredge and Chase Rice. How did you hook up with them? Van Valkenburg: My first signing after I joined Sony/ATV (following the merger with EMI Publishing) was Brett Eldredge. I knew Brett for a number of years. I was a big fan of his music, and I thought he would be a superstar. I found out that Brett was unpublished, so I called his manager about it. It took me a year to get that deal done—we signed him in 2013. It helped that Brett already knew Ross Copperman and (hit songwriter) Heather Morgan, who is also signed with us. Brett saw that we had a family atmosphere at Sony/ATV. Brett, Ross and Heather have written two #1 hits together, and Ross was the main producer on Brett’s second album, Illinois. Chase Rice was signed to Sony/ATV in 2013. Chase had just co-written the hit “Cruise” for Florida Georgia Line, and he was already a strong touring act. Something that was important to Chase when deciding where to take his publishing was to make sure he had a consistent point person in Nashville. I told Troy (Tomlinson) that I’d like to work with Chase. Chase was pushing the envelope for how the country genre could be defined, and it was intriguing. I called Chris DeStefano about working with Chase. Chris and Chase wrote the hit “Ready Set Roll,” and he produced every song on Chase’s album (Ignite The Night). Chris and Chase have a great producer/artist arrangement, as do Ross Copperman and Brett Eldredge. I think another important part of my world is helping to facilitate and maintain writer/producer and artist relationships. DK: In July (2015), you were promoted to Senior Vice President of A&R. What additional duties do you have in this position? Van Valkenburg: Troy (Tomlinson) promoted me to Senior Vice President of Nashville A&R, which was a new title. Before my promotion, every creative exec reported directly to Troy. Troy wanted someone to be the head of the creative team. Because of the success I had and his appreciation of how I approached my work, he thought of me to lead the team. Our creative team consists of Terry Wakefield, Tom Luteran, Abbey Adams, Hannah Williams, Ed Williams and me. One of the great things about having the opportunity to lead this team, is that I’m working with true, pro publishers—there are no weak links. They’re all inspired to be the best they can be, and welcome the accountability. Everyone has stepped up to the plate. DK: Who are some of the newer songwriters you are working with that you’re excited about? I’m also excited about the pop/soul duo Johnnyswim (Amanda & Abner Ramirez). They’re starting to work on their second album, and we’re setting them up with co-writers. They’re so immensely talented. Another new artist is Adam Craig, who is signed to Broken Bow Records. He’s making his first album now and he’s writing killer songs. Adam has spent a lot of time as a live performer on the road. He’s a fantastic singer. DK: As Head of A&R at one of Nashville’s top publishing companies, I’m sure you’ve been asked the question—What advice can you give to new songwriters who are trying to break into the music business? Van Valkenburg: My main advice is—don’t chase after someone else’s sound. Find your own authentic brand of songs, and make these the best they can possibly be. Great songwriters have a brand—you’ll hear people asking for a Craig Wiseman song, a Dean Dillon song, a Ross Copperman song or a Natalie Hemby song. They write songs in a certain style and they’ve created a consistent sound. It can help to extend your shelf life as a pro-songwriter, when you create your own songwriting brand. DK: Most execs agree that it’s important for young writers to live in Nashville. Is that the case? Van Valkenburg: The Nashville perspective is—to have true success you have to immerse yourself in the community. To work from afar isn’t going to cut it. You have to move here and be here, and spend time becoming a member of the music community. DK: Once a writer is in Nashville, how can they become a member of the music community? Van Valkenburg: One thing is to go see a ton of the writer-in-the-round shows. Not only will you learn a ton about songwriting, but you’ll slowly, organically get to know most of the people at these shows. 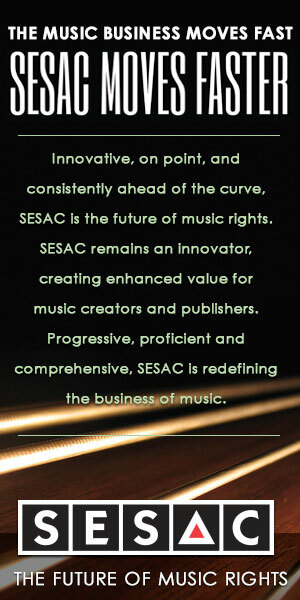 Also, you can network by attending NSAI, ASCAP, BMI and SESAC events, and getting to know the people there. The more people you connect with, the more industry events you’ll start to hear about and be invited to join. As a songwriter, try to align yourself with songwriters you might share a sound or style with. Start to build real relationships. Pretty soon you’ll find a circle of folks on similar paths as yours, and you can make your way through the industry together.